It was hot – part of the time as high as 96 degrees – in Madison Square Garden on May 8th, 1895. Inside were 176 cats exhibited by 125 owners. 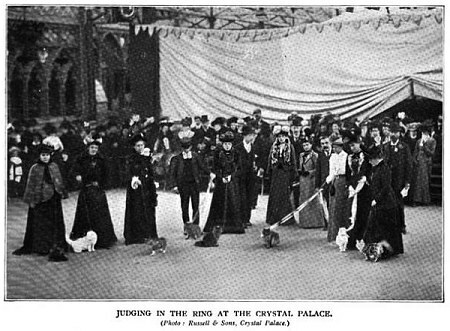 This show was organized by Mr. James T. Hyde, an Englishman, and the idea of holding a cat show came to him after he had attended the Crystal Palace Show in London. Despite the heat, this show was a great success from the time the doors opened until its close, and it may well be said that the show marked the real beginning of the Cat Fancy in this country. True, there had been cat shows held under the auspices of private parties in Boston and Philadelphia prior to 1884, and several minor shows had been held in Newburgh, NY and other places, but the New York shows were the first to attract general attention. The prize for Best Cat in Show, in 1895, went to a Brown Tabby, Cosie, owned by Mrs. E.N. 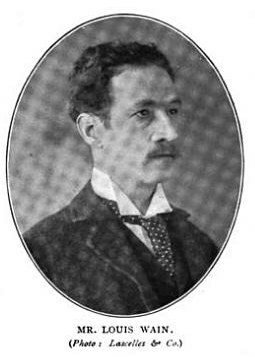 Barker. Dr. Rush S. Huidekoper, Miss Hurlburt, and Mr. T. Farrar Rackham were the judges. After the success of the first New York show, two others were staged in the same year, one at Plainfield, New Jersey, and the other at Newburgh, New York. No details are available on the show at Plainfield. A Brown Tabby male, also owned by Mrs. Barker, “King Humbert”, an import from England, was Best in Show at Newburgh. In 1896, a second show was held in Madison Square Garden. For some unexplained reason, entries dropped from the preceding year and numbered only 132 cats and 82 owners. At the close of this show, an American Cat Club was organized with Dr. Huidekoper, President, for the purpose “of investigating, maintaining, controlling, and publishing a stud book, or book of registry of such kind of domestic animals in the United States of America and Canada, and of promoting and holding exhibitions of such animals, and generally for the purpose of improving the breed thereof, and educating the public in its knowledge of the various breeds and varieties of cats.” Unfortunately, The American Cat Club lasted only a year, and there is no further record of a show being held in New York until 1902. Five cat shows were held in the United States in 1896, in addition to the second Madison Square Garden event. In Springfield, Massachusetts, there were shows on January 1st and October 21st. The first cat show in the Dominion was held in Toronto, Canada. And, again in Plainfield and Newburgh. At Newburgh, King Humbert was Best Cat a second time. The Brown Tabby appears to have been, by far, the most popular show cat in these early years. In 1898, cat shows were held in Milwaukee (in conjunction with an all-pet exhibition) and Boston and Hartford, Connecticut. Danbury, Connecticut followed in 1899. The first real show to be held in Chicago was in 1899, three years after those in New York, although some cat shows had been held there in conjunction with poultry exhibits as early as 1896. This show was such a success that a club was formed called the Chicago Cat Club. This club was an incorporated unit under the direction of Dr. C. A. 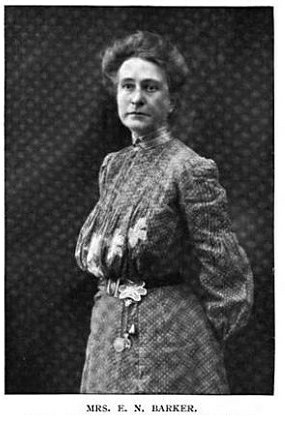 White and Mrs. Leland Norton, its president. Within a year, however, the stronger Beresford Cat Club put it out of existence. Beresford was organized one month after the Chicago Cat Club, in the winter of 1899, and twelve months later, in January 1900, it staged the first of a series of annual championship exhibitions. 178 prizes were awarded in this first show. The exhibits covered short and long haired cats of all colors and sizes, with Siamese cats, Manx cats, and Russian cats among those present. 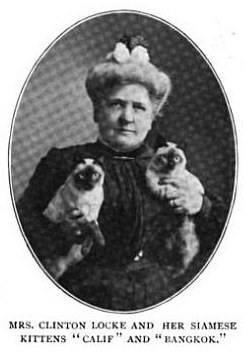 Mrs. Clinton Locke exhibited 14 cats of one color, and Mrs. Josiah Cratty, 5 white cats. A silver male, Lockehaven Smerdis, belonging to Mrs. Locke, was judged Best Cat in Show. Smerdis was bred by a Mrs. Trumper of Windsor, England, and was born May 22, 1897. He was sired by Lord Southampton ex Silver Spray. Membership in the Beresford Cat Club was national and numbered some 170 within a year’s time. However, the officers and the Board of Directors were all from Chicago. The following were the officers of the original Beresford organization: Mrs. Clinton Locke, president; Mrs. Josiah Cratty and Mrs. Eames Colburn, vice-presidents; Mrs. Charles Hampton Lane, treasurer; Mrs. Chauncey F. Smith, corresponding secretary; Mrs. Charles De Witt, recording secretary. Board of Directors: Mrs. Elwood H. Tolman, Mrs. William Penn Nixon, Mrs. Jerome H. Pratt, Mrs. M. Fisk-Green, and Miss Lucy C. Johnstone. The Beresford Cat Club published its first Stud Book and Registry in 1900. There were 146 entries covering the period July 1899 to July 1900. The registration fee was one dollar. No. 101, “Lake Shore Vashti”, a Golden-eye Blue Female Long Hair, owned by Mrs. S. E. Gross of Chicago, was the first entry. There were four volumes of the Stud Book published by Beresford. The final one included entries up to July 1905 – number 1039 was the final entry in the Beresford registry. The Recorder was Miss Lucy Johnstone. She continued to serve in that office with the American Cat Association. 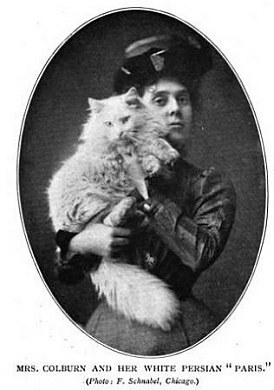 The Beresford Cat Club was named in honor of Lady Marcus Beresford of England, the founder of The Cat Club of England in 1898, and one of the foremost English breeders at the end of the nineteenth century. Lady Beresford had done much to aid breeder-exhibitors in America, particularly those in the Chicago area. Mrs. Clinton Locke, founder and first president of Beresford, was the first woman in America to operate a “cattery”. This had been in existence for at least 25 years before 1900. Mrs. Locke had the second imported cat in the United States. The first was Madam, a Black Longhair from Spain. Mrs. Locke’s stock carried off the Best Cat Awards in each of the first three Beresford shows. A Blue female, Melrose Lassie, was the winner in 1901, and Lupin, a Blue male, in 1902. In the West, the first club, the Pacific Cat Club, of San Francisco, was organized in 1900, and shows were held in Los Angeles and Fresno, California the following year. The Louisville (Ky) Cat Club also had its start in 1900 and an exhibition was held in Memphis, Tennessee the same year. Back in New York, a show was held in January 1902, in the concert hall which opened out of the main hall at Madison Square Garden. This show was well attended, even though comparatively small, as entries numbered only about 110. However, the quality of the cats had improved greatly in the five years since the preceding show and it was said that the class of Silvers was good enough for any country. The enthusiasm generating from this show resulted in the organization of the Atlantic Cat Club in 1902, which is one of the clubs listed in Volume I of the Cat Fanciers Association Stud Book, published in 1909. Another show was held in 1903 at the same location. The collection of challenge cups and other specials showed clearly the rapidly growing interest and strength of the fancy in the area. Mention must also be made of the Boston shows held in the early 1900’s. These shows provided the opportunity for northern exhibitors and cats to meet and compete together. The Beresford Cat Club held two shows in 1902. The one in January had an entry of more than 250 cats, which was at least 100 more than any show ever held up to that time in America. A second show was held in December and represented what normally would have been the 1903 show. It was here that the string of Mrs. Locke’s Best Cat in Show wins came to an end, and an Orange-eye White male, Bartimeus, owned by Mrs. Josiah Cratty, won the award. It is interesting to note that shows had also been held in Cleveland, Rochester, Cincinnati, Stamford, and Detroit, in addition to the ones already mentioned, prior to 1904. Unfortunately, no details concerning them were available at the time this article was written. At this point, our attention is inevitably drawn to the early breeders and fanciers in America, although lack of space prohibits mention of more than a very few. In the east – Mrs. A.L.Pollard, Elizabeth, New Jersey; Mrs. W.F. Hofstra of Long Island, the President of the Atlantic Cat Club in 1903; the Misses Ward of the Lindenhurst Cattery at Ridgefield, New Jersey; Dr. Ottolengui, Saratoga, New York; and Mrs. Champion, with her two daughters, of Staten Island, New York. 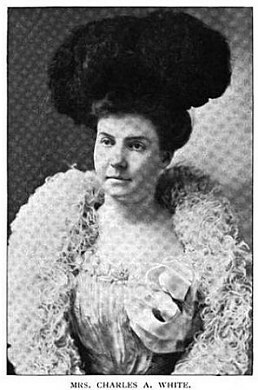 Moving westward to Chicago, in addition to Mrs. Locke and Mrs. Cratty, there were Mrs. W. Eames Colburn, Miss L.C. Johnstone, Mrs. Jerome H. Pratt, Mrs. F.W. Story, Mrs. E.N. Barker and many others. In Detroit, Mrs. Owen, of the Owena Cattery was a prominent breeders, as well as Mrs. W.M. 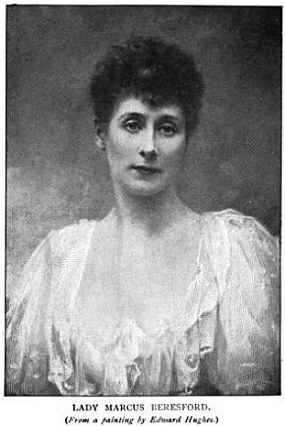 Chapman, Mrs. W.J. Stanton, and Mrs. N.C. Ellis. Mrs. C.H. Hoag and Mrs. C.E. Martling, of California, were two of the most energetic in promoting the fancy. Siamese appear to have dominated in the far west at that time. 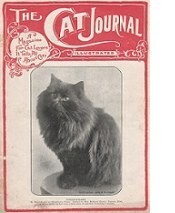 The first cat magazine in this country, “The Cat Journal”, was founded in 1901, in Palmyra, New York, by Mrs. C.H. Jones. In 1903, “The Cat Review”, owned and published by Mr. and Mrs. Oliver L. Dosch of Dayton, Ohio, made its appearance. The first issue was dated June 25, 1903. “The Cat Review” moved to Elizabeth, New Jersey, in 1907. In 1904 and 1905, shows were held in New York, Detroit, Washington, Rochester, Albany, and Chicago. Along with the above named cities, Buffalo, Cleveland, Toronto, Danbury, Stamford and Milwaukee also had shows in 1906. The cat fancy was spreading rapidly! Brief mention must be made of the 1905 show in Albany. There were 110 cats present and competing, including many top-ranking champions from the East and Midwest. Mrs. Barker officiated, and selected as her Best Cat a Black Domestic Shorthair, Black Peter. Unfortunately, there is no record of the owner’s name. And, in 1906, the Beresford Cat Club, as an Association, ceased to exist. From it ensued the American Cat Association. However, Beresford, as a Club, was listed at that time, and remains today, a loyal and true member of the American Cat Association. On February 4-5-6, 1908, Beresford held its annual show. In an effort to have an outstanding judge who had never before officiated in America, the Beresford show officials had secured the services of Mr. Louis Wain of England. Mr. Wain was well known on both sides of the Atlantic ocean as an authority on cats and his illustrations of cats were very popular. He had also served as president of the National Cat Club of England for many years. When the show was concluded, Mr. Wain hung the award for Best Cat in Show on the cage of Lockehaven Elsa, a Seal Point Siamese female, owned by Mrs. Clinton Locke. The award startled the cat fancy from the Atlantic to the Pacific and changed the opinion of exhibitors and judges alike toward the Siamese. Never again would they be looked upon as a “novelty cat”! The first major rift occurred in the Cat Fancy in 1908. This resulted in the formation of the Cat Fanciers Association.